Definition at line 28 of file CVersion.h. Definition at line 37 of file CVersion.cpp. 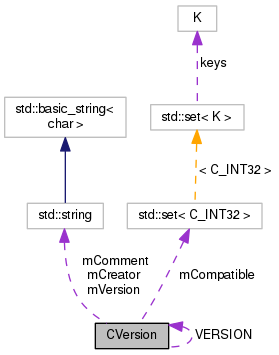 References C_INT32, COPASI_VERSION_COMPATIBILITY, mBuild, mCompatible, and setString(). Default constructor. This creates a version object without any version info. Definition at line 66 of file CVersion.cpp. Definition at line 79 of file CVersion.cpp. Returns a string with the full version number. Definition at line 139 of file CVersion.cpp. Referenced by CCopasiXML::load(), CCopasiXML::save(), CConfigurationFile::CXML::save(), and writeLogo(). Returns the development version number. Definition at line 129 of file CVersion.cpp. Referenced by CCopasiXML::load(), and CCopasiXMLParser::EventElement::start(). Definition at line 119 of file CVersion.cpp. Definition at line 124 of file CVersion.cpp. Definition at line 82 of file CVersion.cpp. References mBuild, mCompatible, mMajor, and mMinor. Definition at line 134 of file CVersion.cpp. Definition at line 144 of file CVersion.cpp. References mBuild, mComment, mMajor, mMinor, mSourcesModified, mVersion, and StringPrint(). Referenced by CVersion(), and setVersion(). const std::string & creator = ""
Definition at line 102 of file CVersion.cpp. References mBuild, mComment, mCreator, mMajor, mMinor, mSourcesModified, and setString(). Definition at line 47 of file CVersion.h. Referenced by CVersion(), getVersionDevel(), isCompatible(), setString(), and setVersion(). Definition at line 58 of file CVersion.h. Referenced by setString(), and setVersion(). Definition at line 74 of file CVersion.h. Referenced by CVersion(), and isCompatible(). Definition at line 64 of file CVersion.h. Definition at line 36 of file CVersion.h. Referenced by getVersionMajor(), isCompatible(), setString(), and setVersion(). Definition at line 42 of file CVersion.h. Referenced by getVersionMinor(), isCompatible(), setString(), and setVersion(). Boolean value indicating whether mBuild is describing the current state of the sources. Definition at line 53 of file CVersion.h. Referenced by isSourceModified(), setString(), and setVersion(). Definition at line 69 of file CVersion.h. Referenced by getVersion(), and setString(). Definition at line 164 of file CVersion.h. Referenced by CopasiUI3Window::about(), CopasiUI3Window::CopasiUI3Window(), CSEDMLExporter::exportModelAndTasksToString(), CSBMLExporter::exportModelToString(), Copasi2SBMLTranslator::getVersion(), CQSplashWidget::init(), CCopasiXML::load(), CCopasiXML::save(), CConfigurationFile::CXML::save(), CQSplashWidget::slotViewLicense(), and writeLogo().